Feedly announced their new URL shortening service this week, and it turns out that they are much more subtle scoundrels than I expected. Not only is this new service opt-out, it also siphons away page views from mobile visitors. Update: Feedly announced on the Feedly beta Google+ community (on 21 January) that they are removing the offending Twitter card integration. This URL shortener service is the same one which Feedly was caught using to hijack links and steal page views back in December (that was during the beta test). Feedly stopped hijacking links after being criticized from all sides, but they didn't change their behavior. Rather than try not to harm publishers, Feedly found a more subtle way to steal page views and make it difficult for publishers to engage with readers. It's so subtle that I missed it, but luckily a reader (Thanks, Alan!) tipped me to a blog post by Martin Hawksey. 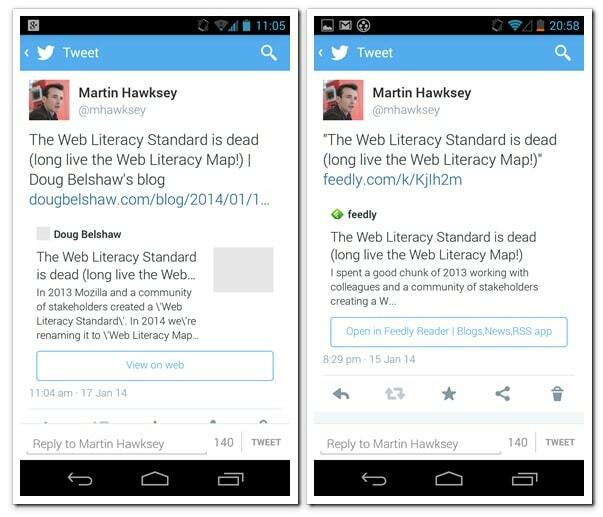 Martin wrote his post with a focus on how Feedly is inserting its own twitter metadata in place of the metadata that original publishers can include with links shared on Twitter, but he also posted a couple screen shots which make it quite clear that Feedly is harming publishers in more ways than simply messing with the metadata. The 2 screen shots below were taken from the Twitter app on an Android smartphone. They show two different tweets which link to the same content. The screenshot on the left shows a tweet that was shared from the original publisher's website, while the screenshot on the right shows a tweet that was shared from inside Feedly. I can see a couple key differences, and both are hostile to publishers. One, Feedly is slapping their brand on someone else's content, and two, they're actively discouraging mobile users from visiting the original publisher's website. In the screenshot on the left you can see that the inset text lists the author as Doug Belshaw. In the screenshot on the right, Feedly wants you to think that they are the author. In other words they slapped their brand on work they did not create. They want people to think of them as the source of the content, probably in the hopes that this will boost Feedly's profile and its userbase. And to make matters worse they are pulling this trick both on the Twitter website and in the Twitter apps. The prompt to use/install the Feedly app is not visible when you visit the Twitter website, only when you visit via a mobile app. This might seem like a small issue, but as of October 2013 Twitter reported that 75% of their 218 million users use the service via a mobile app. That means that Feedly has set itself up to steal most of the page views that a publisher could have gained when an article is shared via Twitter. Feedly is depriving creators of recognition, and they are also stealing page views. And to make matters worse, I have confirmed that this URL shortener is enabled by default. That means that Feedly users need to go to the Preference menu to disable the URL shortener or they will be inadvertent accomplices to Feedly's theft of page views. As I mentioned in the email I sent to Nate earlier this morning, the goal of this feature is to 1) help content creators increase their readership in feedly (when a user discovers your content and adds it to his feedly, they are converting a one time visitor into a repeat engaged user) and 2) help user consume content faster on mobile device. We are early in the design and implementation of this feature. If you are a publisher and want to work with us on improving this feature (we are working on some interesting features around discovery, call to action, analytics), please email me at (deleted) If you do not want to benefit form this feature, you can also sent me an email and we will quickly opt you out. He thinks it is perfectly okay to expect publishers to opt out of being punched in the wallet. I really don't know what to say to that. I used Feedly for a while, but never much cared for it. When I heard about BazQux, I signed up for the free trial, and when the trial term expired, I signed up for the $9/service. I showed BazQux to my wife, and she signed up immediately, bypassing the free 30-day trial. $9/year is a flea-bite, and BazQux is well worth it. Ok, the BazQux author allows you to voluntarily pay more, but I’m between contracts, and deliberately being cheap. P.S. If you are a headhunter, or a manager looking for an embedded systems programmer with over 2 decades of experience, please check out my resume on my “vanity” site at howardleeharkness dot com. Thanks, Nate, for the article. I’ve just opted-out. Stealing pageviews from a publisher doesn’t affect a user who shares publisher’s article on Feedly, unless you share your own article. But sharing on Facebook the article with no image or description hurts the response. The only good news is that its not doing this if you’re using a service such as readkit to display feedly. It does do this if you use feedly’s own apps to access the feeds. Rather than huff and puff and mope around about it why not simply build around the problem. You could include a static Google analytics tracking pixel into your RSS feed and then you can track your precious page views. That is a good idea in general, but it’s not going to help me in terms of engagement or ad revenue. And are you really suggesting that we should let Feedly get away with this scheme? Tracking pixel could be filtered by regex. The main difference I see is the name “Doug Belshaw” was erased 3x. Also the timestamp was set back two days. Hmm. This makes me miss Google Reader even more! I guess there won’t be an ethical replacement. Going forward, there’s a pretty good chance that the only way you’re going to get ethical anything is with your own server. OwnCloud already has this covered and their are android feed readers that are able to sync with ownCloud’s RSS reader. I’m using it since GReader death was announced and it works perfectly for a free service. You know what I hate? Ads on websites. No sympathy here for this. In fact, as a consumer of content, I prefer feedly’s method by far. Many publishers have terrible mobile sites, where as feedly is 1. Super mobile friendly. 2. Clear of clutter. 3. A familiar environment for me to read in. Rather than worrying about losses to your ads, try creating greater value in product and publications to get your readers to buy something from you. It’s challenge to change business models, but it’s easy to overcome if you are flexible. Not every publisher has something to sell. What would you suggest bloggers trying to cover hosting costs do? Your comment is inherently contradictory. You apparently care enough about the content (aka ‘the product’) to want to read it and be annoyed by the ads yet you tell them they need to come up with a better product. 2. A reader service that allows me to efficiently browse ~150 articles per day. I need both. If I Tweet just the publisher’s version #2 gets no credit for enabling me to actually get to that story on any given day. Feedly’s policy gives visual credit to both the service and the publisher. And, as stated, the publisher could add a pixel and claim the credit for the view. Are you suggesting that Feedly get zero public acknowledgement that their service actually enabled the view? That does not seem quite fair either. RSS subscribers are in the minority of all web content consumers I’m sure, but it is a service worth promoting. Take out Feedly’s visibility and you fail to show the value of using a reader. This comment was brought to you by Firefox ™, 1and1 Hosting ™, and Google ™. No, Feedly doesn’t deserve credit for the content any more than the Firefox web browser I am using at the moment, or the ISP I use to access the internet, or the whichever webhost happens to be renting server space to the website. The creator deserves credit, and anyone claiming credit in a manner similar to Feedly’s is simply wrong. And how can you say that Feedly isn’t getting credit when the link says “feedly.com”? If that’s not enough credit, then Feedly can simply append “via @feedly” to the tweet and get a nod that way. I understand your point. But, I don’t think anyone thinks of Feedly as the “creator” but as the enabler or distributor. And promoting their service with “via @feedly” is a good solution. Is this not the same type of foul? You have a comment section here — why not just link off to your site? Content is still evolving — and neither of these Feedly of HN scenarios is ideal…content discovery is a challenge and if someone can find your content via Feedly they know they have to go to your site to find more of same….that Feedly steals a bit of the light in the process, I don’t have huge issue unless it had significant financial impact or caused confusion with readers who thought that somehow Feedly was, in fact, the creator. I don’t see any similarity. Hacker News isn’t trying to encourage readers to read the copy of the post on their servers rather than read the original post. And the Hacker news platform isn’t set up to deny visibility to the creator. I feel misled by your post. As a customer of Feedly I have the choice whether to use a shortened url or the full url. Readers have a choice whether to read your content on your site or on Feedly and it is all fully disclosed. Your comment about whether “we” are going to let Feedly “get away with it” makes me think that you perceive you control Feedly more than you actually do. I would suggest you focus on improving the content on your website so people want to visit and return. I don’t know that you and I will ever see eye to eye on this; there’s a fundamental rupture between the viewpoint of the reader and that of the publisher, with the latter group being constantly worried about seemingly minor issues like this. What you see as a choice is viewed from this side of the aisle as a system designed to benefit Feedly at the expense of content creators. Sure, you see the option of using the URl shortener to share the link, but I see a system which is set up to hurt creators, one where the average user has to decide to not hurt publishers. If I did not have appealing content then people would not be sharing it, and Feedly’s actions would not be an issue. I’m a content creator and I am 100% not hurt by what Feedly has done. If anything, I am grateful because they’ve created a simple tool that allows more consumers to follow my content very, very quickly on their mobile devices, and then instantly share it with hundreds or thousands of their followers via social media that I could have never reached on my own. This lack of “credit”, which still links back to MY article that I wrote (and has my name at the bottom of), is the very smallest price I could pay for the value that I, and my readers, get from the service. I also agree with David and think that you might be misinterpreting the feature (I’ll give you the benefit of a doubt that you’re not outright trying to tarnish Feedly’s image). I immediately turned off the shortening service option in my account, but then this awesome discussion started taking place on Google Plus this morning where Edwin Khodabakchian from Feedly helped explain what the feature was really doing. So the Feedly team is conscious of what happens to those links and is listening to what their users are saying. I think that you are doing great in making sure that we keep service providers in check, but at the same time we want to give them a chance to explain their point of view too. Do you have a link to that discussion on Google plus? I’d like to read it. Thank you Nate for this post and your fast reaction! Unfortunately I don’t think that they’ll stop doing this. They knew that there will be some uproar, so that’s why they timed the official launch of this “feature” together with a major release of their iOS app, so the focus of the big publishers will be exactly the latter. They must have weighted the little negative PR together with the possible increased flow of new users and the latter won. No one can convince me that they are doing this for any other interest than their own. I’m also worried what will happen to those “shortened” links when (not if!) their servers go down? Bit.ly takes this very seriously, but I’m not sure Feedly does. But one was shared from feedly, the other not. What the screenshot does not show is that 99.9% of the users click on the link and go to the web version of the content creator and 0.1% click on the open in feedly and connect with the same content creator in feedly. Our mission is to serve readers and content creators – and we love them both.? Update: after reviewing the screenshots with the rest of the team and crunching through all the feedback we collected, we decided to remove the twitter card integration to avoid all potential confusion on the attribution of the content. Instead, we are going to reach out to content creators and offer those who want to grow their feedly community an “add to feedly” button. This update is now live.? Thanks for the link! It’s a pity Google+ won’t let you link to a specific topic. I don’t buy the 99% detail. When it comes to mobile the big button is easier to see and press, and that means that if the user already likes and uses Feedly they will click it. And if there were no value to having the button suggest the Feedly app then why have the button? BTW, even if most people don’ click the button it is still an advertisement for Feedly. Feedly is the worst reader in the history of readers. They just got lucky and somehow won some popularity contest after Reader closed shop. I ended up being pleasantly surprised with Digg’s reader which is slick, simple, and much like the old Google Reader. In the screenshot on the left you can see that the inset text lists the author as Doug Belshaw. In the screenshot on the right, Feedly wants you to think that they are the author. In other words, they slapped their brand on work they did not create. They want people to think of them as the source of the content, probably in the hopes that this will boost Feedly’s profile and its userbase. Can you say “wilful copyright infringement”? Great article, Nate. I’m not a fan of Flipboard, Feedly and Facebook all trying to make their sites more sticky on the backs of someone else’s content. If someone clicks a link to a story, send them to the original site, not a scraped RSS version of the story on your site.